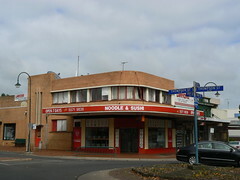 This noodle & sushi shop at 90 Gray Street, Hamilton was originally Uren's Pharmacy. It was built in the late 1930s and designed by architects Seabrook & Fildes. The input of this Melbourne firm explains the relatively grand side entrance (leading to offices) with two fins sitting across the vertical window above the doorway. 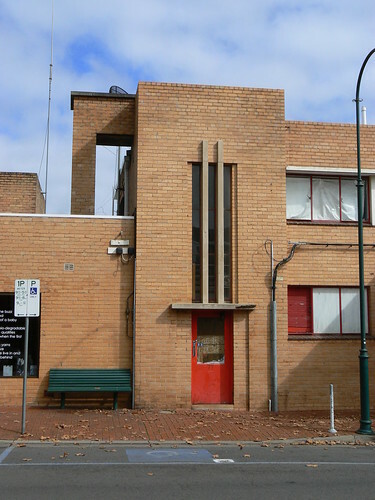 great building for a country town - Seabrook always like to put red doors in his buildings. Thanks Robin. Red door & window frames I see on this one.